Michael Kupperman is a graphic novelist with a cult following (Snake 'n' Bacon's Cartoon Cabaret, Tales Designed to Thrizzle). For readers used to his oddball sense of humor and arcane references, he's created his most mainstream book yet in All the Answers , the kind of book his own parents would read. A departure for Kupperman in many ways, All the Answers is a graphic memoir, the story of his fraught relationship with his child-celebrity father. The writing is clear, direct, and poignant—powerful. 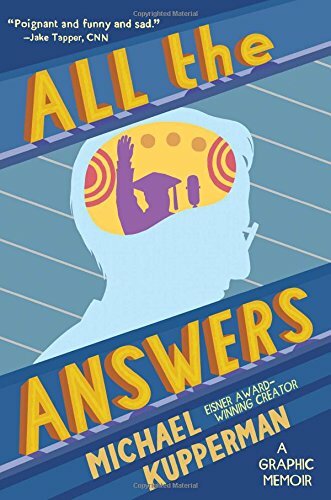 While the framing story is about Kupperman trying to reach his always-distant father before he sinks into the fog of dementia, the interior story is about Kupperman's father's life as the most famous Quiz Kid on the popular radio program from the ’30s and ’40s, math genius Joel Kupperman. Kupperman does his research on the how the program came to be and how the use of cute Jewish kids was an attempt to combat the current stereotypes about Jews, to make the Jewish people seem worth saving. This inner story is the meat of the book, how celebrity shaped—deformed, even—Joel's life, from the time he was six, when he first appeared on the show, until he left it at sixteen. As a child, Joel met celebrities, presidents, and major industrialists. Henry Ford insisted on meeting the Quiz Kids and specifically sought out Joel. Ford was a vocal anti-Semite who propounded the canard of Jews controlling the world in a set of pamphlets he published in the 1920s on what he called “the Jewish menace.” Still, even he was smitten by the adorable, lisping math whiz. Joel traveled around the county selling war bonds and even made a movie with Donald O'Connor. Of all the Quiz Kids, he was the most famous and stayed on the show the longest, even after it made the transition from radio to television, but he was also the most reclusive, refusing to attend any of the many reunions, refusing to talk about the show at all, not just to reporters, but to family and friends. Kupperman does a superb job of showing how intrusive fame can be, especially for a child. He paints his own relationship (or lack thereof) with his father equally well. What's left out is Joel's wife and Kupperman's mother, but perhaps that will be the basis for another graphic memoir. We can certainly hope so.